Genetics can have a profound influence on the degree of alcohol intoxication, and the basis for this influence lies in our ability to metabolize alcohol. Alcohol is metabolized by enzymes (proteins) in 2 steps. The first enzyme, alcohol dehydrogenase (ADH) helps oxidize ethanol to acetaldehyde, a relatively toxic molecule. The second enzyme, acetaldehyde dehydrogenase (ALDH) detoxifies acetaldehyde by helping to oxidize it to acetic acid (vinegar). Figure 2.9 ADH located in the cytoplasm converts alcohol to acetaldehyde, which is toxic. 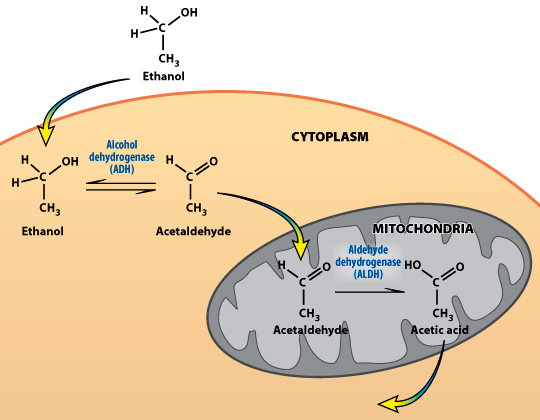 But ALDH in the mitochondria quickly converts acetaldehyde into acetic acid. All of our proteins, including the two alcohol metabolizing enzymes (ADH and ALDH) are synthesized under the instructions encoded by specific genes. Interestingly, humans have as many as seven different ADH genes and nine different ALDH genes. Of these multiple genes, some are more important than others in their influence on intoxication. Genes are long stretches of deoxyribonucleic acid or DNA. DNA, the “code of life”, is built from combinations of four bases: cytosine, adenine, thymine, and guanine or C, A, T, and G, respectively. Subtle changes in the sequence combinations of these four bases in long stretches of DNA code contribute to genetic diversity among individuals in the population. Genes that exist in multiple forms within the human population are polymorphic genes, while genes that exist in a single form are monomorphic. Lets consider how different alcohol metabolizing genes affect the degree of intoxication. Of the seven forms of ADH protein (i.e. ADH1-7), the ADH2 form is highly expressed in the liver. The ADH2 enzyme accounts for most of the alcohol metabolism. Scientists have found three different versions of the ADH2 gene in the human population. These genetic polymorphisms of the ADH2 gene arise from small mutations. One ADH2 polymorphism has been linked with an increased susceptibility to developing alcoholism in Caucasians. Alternatively, the ADH7 gene is monomorphic (only one form of the gene exists in the human population). ADH7 is highly expressed in the stomach and metabolizes about 30% of the alcohol before it is absorbed into the blood. One of the reasons females are more sensitive than males to the intoxicating effects of alcohol is because females do not express the ADH7 protein in their stomachs (even though they have the ADH7 gene!) The ADH7 gene in females is not transcribed and translated to protein – it’s switched off or “silent”. Figure 2.10 Of the 7 ADH genes, the ADH2 is polymorphic (3 different forms) and the ADH7 is monomorphic. Half of Oriental Asians inherit an ALDH allele (ALDH2) that codes for a nonfunctional ALDH enzyme. The ALDH2 allele carries a single base mutation (a G is converted to an A) to render it non-functional. Normally the ALDH enzyme breaks down acetaldehyde to acetic acid, but the enzyme encoded by the ALDH2 allele can’t carry out this task. Acetaldehyde levels in individuals expressing the non-functional enzyme can be 20 times higher than the levels of individuals expressing the functional enzyme. This is because the ALDH enzyme is responsible for the break-down of acetaldehyde to acetic acid in the body. Because they are not able to metabolize the acetaldehyde, Oriental Asians with the ALDH2 allele feel sick when they drink ethanol. Their symptoms can include a flushed face, headache, nausea, and a rapid heart rate. As a result, the high levels of acetaldehyde cause such an unpleasant feeling that people with the ALDH2 allele don’t drink alcohol. In fact, alcoholism is virtually unknown in people with this allele. The gene has actually protected them from alcohol addiction. Although most of the nine ALDH genes are polymorphic, ALDH2 is the single genetic factor that most strongly correlates with the incidence of alcoholism in humans.